The small town of Ben Gardane, or Bin Qirdan as it is also known, was founded by the French in 1892 and still has some French influences. 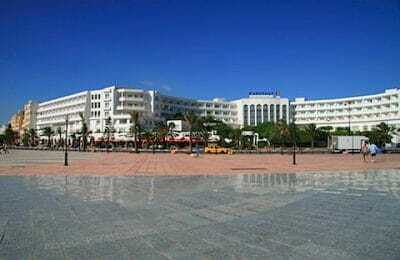 It is 33km from the Libyan border on the Mediterranean coast of Eastern Tunisia. 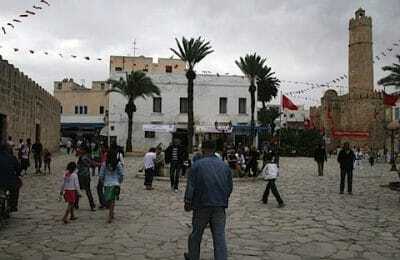 With a population of just 2,500 Ben Gardane is well off the tourists’ beaten track but the lure of the Libyan markets draws many visitors and locals. 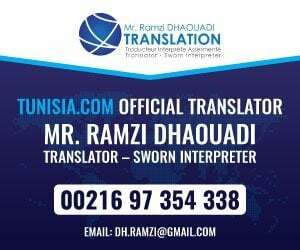 Ben Gardane is typically Tunisian with two-storey houses along the dusty roads which are lined with shady trees. The town’s principal trade is its markets and many of the stalls sell “legally” imported goods from Libya such as electronics, sun glasses, cigarettes, clothing, nuts, Senegalese tuna boxes and tyres. Tunisian merchants travel from all over Tunisia to buy goods from the dedicated Libyan markets which are held just north of the town. Besides the Libyan markets there is a livestock market on Thursdays and an agricultural market on Saturdays. Other local livelihoods are based on agriculture including the extensive olive orchards in the area. The surrounding landscape is dry and arid. The road from Ben Gardane to the border, the only entry point into Libya from Tunisia, is lined with pottery stalls, foreign exchange booths and smokey braziers at outdoor grill-cafés. These offer excellent tender lamb dishes and are a good place to stop for lunch or dinner. Westerners need a visa to cross into Libya. Many travellers choose to self-drive along the dusty road to Ben Gardane and a 4X4 is a good idea. Though it’s mostly safe, this is a location where having a guide with you is highly recommended. From Ben Gardane fast shared taxis (louages) run to Houmt Souq, Tatouine and Medenine and are the best form of public transport. European standard hotels are rare but visitors will be able to find basic accommodation at any one of the ten hotels in Ben Gardane. Restaurants The town has a handful of small local restaurants. There is no nightlife in Ben Guerdane. The town has regular banks for foreign exchange and drawing cash from credit cards. There is an active black market, usually for Libyan dinars and they usually offer Tunisian dinars at a better exchange rate than the banks. However, black market currency trading is illegal and, if caught, the situation could be an unpleasant one, so avoid this.